Ask my American born 4 year old what he wants for breakfast and before you’ve even finished the question he’ll have told you. Pancakes. Always pancakes. 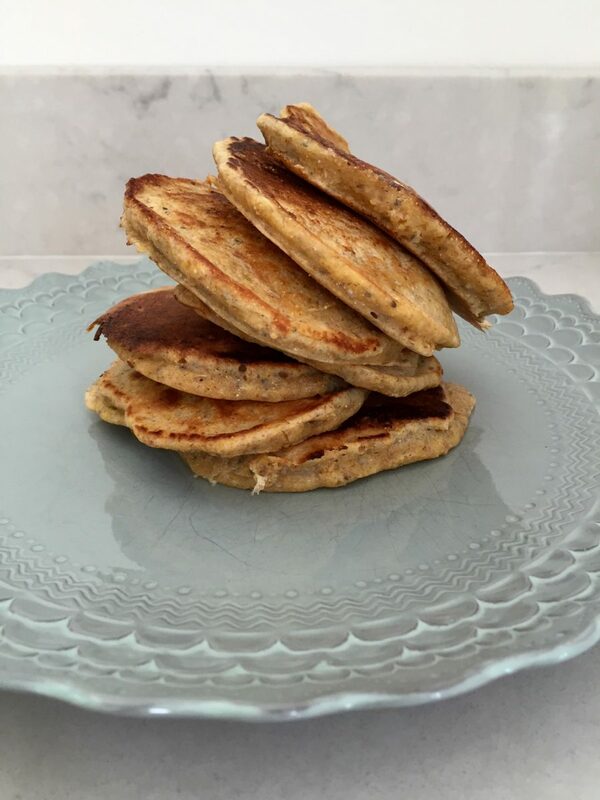 I can’t always find the time in the morning to indulge him but when I do, these are the grain packed healthy pancakes I make. These are far from the boxed fluffy American pancakes many people are used to. The ones from the box, easy and nostalgic as they may be, have very little goodness in them. These fellas are jam packed with toothsome grains and will keep tummies fuller for longer. They are also a great way to clear out random almost empty packets of grains in your store cupboard – in fact that’s how I came up with the recipe. Many American pancake recipes use buttermilk, but because I don’t use buttermilk that often, I find myself with unused cartons of it. So I just use a mixture of yoghurt and milk in my pancakes instead and it has the same effect. This is a perfect weekend recipe and my children can make them without me. My ultimate aim is that before long they will be making me breakfast in bed so getting them involved with recipes like these is all part of my cunning plan (evil laugh). The addition of the cooked brown rice is the bit that may raise eyebrows but it gives a gorgeous texture to the pancakes. I keep a big bag of cooked brown rice in the freezer to speed up all manner of meals. It is a great habit to get into – just cook double the rice you need and freeze it after it has gone cool. The frozen rice can be thrown into pasta sauces for a quick faux-risotto. It is also brilliant for speedy fried veggie rice or my brown rice rice pudding. Read all about how to cook and store brown rice here. 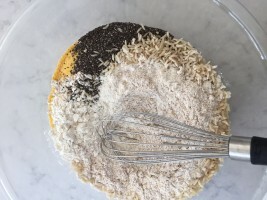 If you want to be very fancy you could make a big batch of the dry mixture and then use that as your very own grain packed healthy pancake mix – just add a few scoops to the wet ingredients. I’ve given the measurements American style in cups and European style by weight. If you’re using scales you can just zero out after each ingredient is added to avoid dirtying loads of cups and measures. Any leftover batter will sit in the fridge for 2 days. That way you can be about 6 minutes away from a pancake whenever the mood takes you. 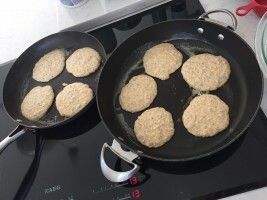 I often cook a few extra pancakes, throw them in the freezer and then pop them in the toaster from frozen for an after school snack or a speedy breakfast. 1/4 cup (50g) plain flour (all purpose flour in the US). This makes the pancakes fluffier. You could use all spelt if you prefer. A couple of tablespoons of butter. We are partial to sliced banana, warmed real maple syrup and a sprinkle of Maldon sea salt flakes. Any fruit is good and honey works well in place of maple syrup. A splodge of my homemade citrus curd and a dollop of plain yoghurt is pretty perfect on these too. Get a large bowl and add all the dry ingredients. Stir well. 2. Get a large measuring jug and add the wet ingredients. Don’t add the eggs until the end. Just add the various liquids, adding each measurement on top of what is already in the jug. Then add the eggs and whisk well until the wet ingredients are combined. 3. 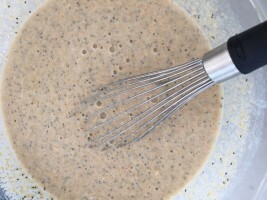 Pour the wet ingredients into the dry ingredients then use a whisk to mix them together until you have a thick batter. 4. Heat a large frying pan or griddle (not the ridged kind) on a medium high heat until really hot then add a knob of butter. Because I have a very hungry small children, I usually put 2-3 frying pans on the heat at once so that I can get maximum pancakes made as quickly as possible. This does mean you need a degree of plate spinning mental ability so if that isn’t you, just use one pan and keep the pancakes warm in a low oven until you’re ready to eat. 5. Drop or pour the mixture into the pan. I usually use a ladle or pour the batter into a measuring jug and pour it into the pan using that. You want the resulting pancakes to be about the width of an apple but it doesn’t matter if they’re smaller or bigger. 6. Cook the pancakes on a medium heat for about 4 minutes, they will start to dry out around the edge and bubbles will appear on the top. Flip them over and cook them on the other side for 4 minutes. If they are looking too pale increase the heat. Too dark – drop the heat. 7. Serve immediately with warm maple syrup, sliced banana and a sprinkle of Maldon sea salt flakes. The salt makes them perfect. 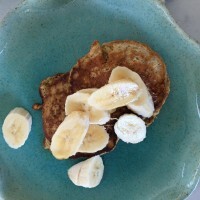 Find more recipes for pancakes, spelt flour and brunch/breakfasts here.